Trackball mice won't be for everyone, but if you're set on the form factor then the MX Ergo does everything you'd need it to. It's got a large, comfortable design, the trackball itself is smooth and accurate, and the ergonomic options are great. Left-handed mouse users may be disappointed by its right-handed only configuration, but otherwise there's little to dislike. Few things in computing have stayed quite as consistent as the keyboard and mouse. With each passing year monitors reach ever higher resolutions and framerates, graphics cards pack in more and more teraflops of graphical horsepower, and CPUs add more cores and greater clockspeeds. In contrast, although peripheral manufacturers will always make bold claims about the speed and reliability of their products, the keyboards and mice they produce are fundamentally the same from year to year. Trackball mice represent a completely different way of interacting with your computer. We’ve been putting Logitech’s new MX Ergo ($99.99 / £99.99 / AU$129.95) through its paces the past couple of weeks to determine whether it’s worth switching away from the traditional mouse. And, depending on what you’re using your computer for, it might just be worth it. Of course, trackball mice are nothing new, having actually existed for longer than the more standard mouse, but they’ve remained a more niche device in recent years. Logitech has remained the most prominent seller of trackballs. It put out the Logitech M570 trackball back in 2010, and prior to that the ambidextrous Trackman Marble in 2008. Despite being around for so long, it’s not hard to see why trackball mice have remained niche. There’s just something that looks intimidating about using your thumb to push a ball around rather than moving the entire body of the mouse. That’s without mentioning the sheer amount of buttons on the mouse. Obviously more traditional mice have suffered from button excesses of their own over the year, but by changing up their placement, the MX Ergo forces you to relearn how to use them. The thumb buttons are the best example of this. Whereas a traditional mouse places the thumb buttons, you know, under your thumb, the MX Ergo places them to the left of your left-click button. The mouse's thumb buttons are located to the right of the trackball. Obviously now that your thumb is dedicated to moving the trackball, it makes sense that the thumb-buttons would have to move, but their new position turns them into extra buttons for your index finger, and we think this removes a certain amount of their utility. It’s nice that they’re there, but we can’t see people making the same use of them as on a traditional mouse. Continuing the tour of the device we’ve got a scroll wheel that can also be pushed left and right for additional functionality, a button for switching between connecting via USB dongle and Bluetooth, and a small button to the left of the trackball that puts it into ‘precision mode’. This essentially slows its responsiveness so you can make smaller, more precise movements. The main event is of course the trackball itself, but there’s strangely little to say about it. Although it’s not textured we never had any trouble with it slipping under our thumb, and it’s just the right size to get maximum control without having to constantly readjust the positioning of your thumb. Since your grubby thumb is going to be touching this thing for hours at a time, there’s a mechanism for removing it entirely to give it a clean. This is done by removing the magnetic plate on the bottom of the mouse and pushing the ball out with a pen, at which point you can clean both the trackball and its housing. This magnetic plate also serves a dual purpose as a means of tilting the mouse up at a 20 degree angle for, Logitech claims, ergonomic reasons. This initially seemed like an odd decision. Is holding your hand parallel to the floor really that bad for your posture? Why 20 degrees? Why can’t you adjust it to any other rotation between the two? But after having used the mouse the decision makes more sense. When tilted up, our arm was in a complete resting position, and when we tilted the mouse back down we noticed the small bend our wrist had to make to accommodate it. Ultimately, the biggest defense against any kind of repetitive strain is always going to be taking regular breaks from sitting at your desk, but we were reassured by the ergonomic considerations made by Logitech. The mouse's magnetic base can be removed for cleaning. You have a choice of connectivity options between Logitech’s own Unifying Receiver (a small USB dongle is included to plug into your machine) or through Bluetooth. We couldn’t discern any differences in lag between the two, so it’s up to you to determine which is more convenient for you. A small button below the scroll-wheel switches between the two, and switching is easy enough that we could see this being a handy means of switching controls between two machines. Of course, if you want to control multiple computers at a time with the mouse then Logitech’s ‘Flow’ software is also compatible with the MX Ergo. The software allows you to control up to three machines simultaneously, including giving you the ability to drag and drop files between the machines. While ambidextrous trackball mice do exist, the MX Ergo is an exclusively right-handed affair. If you like to use your mouse with your left hand then there’s unfortunately no MX Ergo for you. Finally, the mouse charges using a Micro USB port. We haven’t had to charge the mouse yet after having used it consistently at work every day for two weeks, so Logitech’s claim of a battery life of four months feels accurate so far. The mouse is also good at putting itself in standby mode overnight when you’re not using it, the only downside being that it’ll take a second or two to wake up in the morning when you start using it. 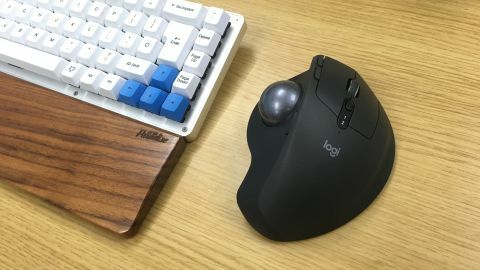 If you’ve been using a traditional mouse your entire life then a trackball will feel incredibly weird the first time you place your thumb on the ball and start spinning away. It’s not just the movement of the thumb that feels different. You also have to get used to letting the trackball spin before stopping it in order to have your mouse travel large distances. Despite the difference, by the end of a single day of use we were back up to our full speed. There’s a small button to the side of the trackball which you can press to reduce the speed that the cursor travel at. This ‘precision mode’ supposedly helps with fine mouse control, and we imagine it might be more useful if you do more precise design work with a mouse. However, for general office usage we had no need for it. The same is true of a host of other buttons included on the mouse. It’s nice knowing that they’re there, but ultimately we didn’t personally have any use for them. The scroll wheel can be tilted left and right for horizontal scrolling, and there are also a couple of replacement thumb buttons that confusingly you’ll access with your index finger now that your thumb is on full-time trackball duty. If you’re reliant on buttons like these to act as shortcuts then you’ll be thankful for their inclusion, but for us they were a purely optional addition. For general office work we were sold on the MX Ergo being as efficient as a regular mouse, but we think it’s more of an acquired taste when it comes to gaming. There are those out there who swear by gaming on a trackball, but we just couldn’t make it work for us. Needing to spin the ball to cover large distances never felt as accurate, and the added hassle of having to switch to precision mode to fine-tune our aim slowed us down an uncomfortable amount. Additionally, while we tend not to rely on thumb-buttons for everyday use, we’ve taken to using them in games to handle ‘reload’ and ‘use’ functions. Needing to use our index finger for the thumb buttons wasn’t convenient when it took away attention from the left mouse button. So, when it came to gaming, we weren’t personally sold on the MX Ergo. But as an office mouse where you’re willing to sacrifice a certain amount of speed for comfort and ergonomics it really shone. One final point about the ergonomics was that while the lack of movement certainly helped with some pain we’d been experiencing in our wrist, using the mouse at a 20-degree angle for long periods would occasionally cause some discomfort because of the way it caused one of our carpal bones to rest on the desk. Trying to compare mice and trackballs is like comparing apples and oranges. They’re two very different input devices that will suit the way different people like to use their computers. But, from looking at the MX Ergo, it’s difficult to know what else a trackball could offer beyond what this model does. The ball itself is responsive and easy to use, the device sits comfortably in the hand, and the connectivity options should satisfy all but the most demanding of users. Its only problem (beyond it lacking a left-handed model) is that some of the features felt a little redundant. We couldn’t find a use for thumb buttons that aren’t pressed using the thumb, and we felt like a scroll wheel that tilts left and right is a little bit of a novelty. Ultimately, these features never detract from the rest of the product. They’re there if you want to use them, but equally they’re easy to ignore if you don’t. What you’re left with is an exceptionally designed product that’s a joy to use. It might not have re-invented the wheel, but when it works this well it’s hard to ask for much more. For some more traditional recommendations, check out our guide to the best computer mice.